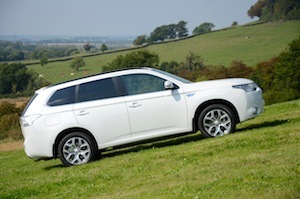 We’ve already driven the Mitsubishi Outlander Plug-in Hybrid Electric Vehicle (PHEV) on its launch event, but what’s it like to live with? And can you come close to its official 148mpg in real life? 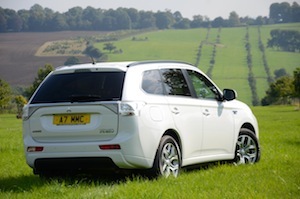 We drove the Mitsubishi Outlander Plug-in Hybrid Electric Vehicle (PHEV) on the launch event, but only over four short routes, so we were keen to live with the car for a week to see what it was really like. For example, we know that it has an official fuel economy figure of 148mpg – but does this bear any relationship to what is possible in the real world? And what other aspects of the car become visible over a week compared to just a few hours? 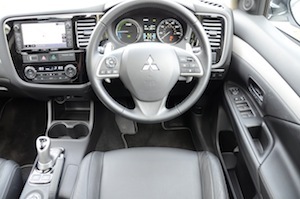 The Mitsubishi Outlander PHEV is a large 4×4 with a hybrid powertrain consisting of a petrol engine together with an electric motor powered by a battery. Such a hybrid system is now a familiar sight in showrooms, but the Outlander has the added ability to be plugged in to your electricity supply in order to provide an official range of 32.5 miles of all-electric driving. This plug-in ability gives it the unique proposition of being the only mainstream 4×4 electric SUV on sale. 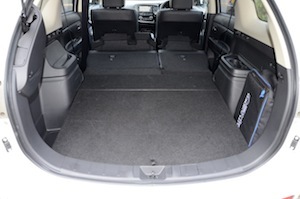 The Outlander is a large, spacious car. During our week with the vehicle we had to transport twelve 1m x 2.3m display panels and amazingly they fitted in the car – there are very few vehicles that would accommodate such large objects, and we can’t think of any other cars that could do this that also have an official fuel economy figure of more than 100mpg. 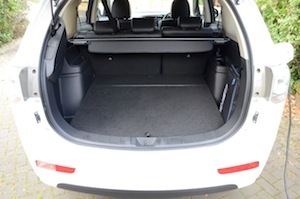 With the rear seats folded flat, the rear space resembles that of a van, and in fact you can actually now buy a commercial version of the Outlander. The Outlander may look a bit bland next to an Evoque, but not everyone may like the styling of the Evoque. 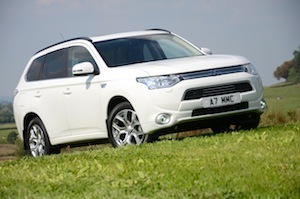 The overall driving experience of the Outlander PHEV is very pleasant: it’s refined and comfortable. However if you’re expecting a driving experience that incorporates any genes of the Mitsubishi Evo you’ll be disappointed. 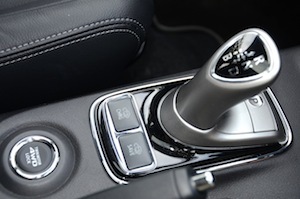 The Outlander has an automatic transmission so it’s easy to drive, but under acceleration this resembles a CVT, in other words the revs rise along with the noise, so it’s not the most direct of driving experiences. The steering is also over light and not particularly sharp, and of course you’re in a heavy car (1,800 Kg) with a high centre of gravity. There are steering wheel-mounted paddles – these aren’t for changing gear, but they instead allow you to choose your own preferred amount of brake regeneration – this is a very valuable feature, and one which is missing in the BMW i3. There’s also a ‘B’ setting on the gearbox which provides more engine braking and more battery recharging. You can choose to drive on electric power, or petrol power, or a combination of both. Two useful features include the ability to save the battery charge, for instance if you’re on the motorway and you’re approaching an urban area, or if the battery is low then you can charge the battery from the petrol engine. We did some light off-roading and the Outlander coped perfectly well. An electric powertrain and automatic transmission works well for off-road driving as it provides lots of torque and the ability for well-controlled creeping. There’s also a ‘Twin Motor 4WD Lock’ to provide added traction if needed. In our opinion the worst bit of the Outlander is the infomedia system. We spent a week trying to pair our mobile phone to the system and completely failed. We even discussed this with two of Mitsubishi’s support staff and they’d experienced the same problem. Attempting to play music from a phone had similar challenges. It’s never great trying to make accurate contact with small areas on a touchscreen when driving, which is something that you’re required to do as there’s no ‘iDrive’-type controller in the Outlander, and the satnav isn’t the best system – it was constantly trying to re-route us and directions are provided by a woman who absolutely yells at you. Other issues that we became aware of after a week with the car included a few buttons being hidden out of view behind the steering wheel spoke or windscreen wiper stalk, such as the traction control switch, a button to change displays on the instrument panel, and one to raise the tailgate. And there’s the lane departure warning system – it beeps at you every time you drive near the white lines in the centre of the road – it’s infuriating and requires switching off every time you start the car. However there’s a very useful reversing camera. 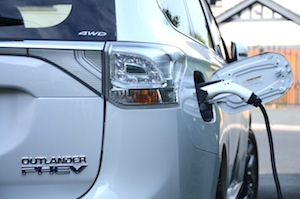 The Outlander PHEV has an official NEDC economy figure of 148.5mpg. This is based a test that is flawed for cars with conventional engines, but which is even more flawed for plug-in hybrids. If you drive very short distances, at low loads, primarily within the electric driving range of 32.5 miles, then you may come close to the 148.5mpg figure. But if this was your normal driving pattern, then a pure EV would make more sense. The Outlander PHEV is designed for people who have a daily commute of less than 30 miles, but who also want to occasionally drive longer distances. If you recorded the fuel economy under such driving conditions over, say, 10,000 miles, then it’s unlikely that you would average 148.5mpg. Real-life fuel economy was a key reason why we wanted to live with the car over a week, and we’ll reveal our findings shortly. However the key thing to remember is that the Outlander is a large 4×4 with a petrol engine, plus the added weight of a battery, so if you generally drive it over long distances at motorway speeds then you’ll return what is typical for a large, heavy petrol 4×4 – ie. around 40mpg. If you stick to around 50mph, you can enjoy 60mpg. If you drive it hard, fuel economy will drop towards 30mpg. The secret is to recharge the car as much as you can if you want to keep the fuel economy figures high. This is an easy exercise involving simply plugging the charger into the car if you have a home charge point (which you should be able to get fitted for free). If your driving patterns are such that you can’t drive mainly on electric power, then you’ll be better off with the diesel Outlander. In our week with the Outlander PHEV our fuel economy ranged from enjoying over 100mpg on shorter journeys to achieving 40mpg at 70mph motorway speeds. Overall, after a week of mostly long distance motorway miles, we averaged 47.1mpg, which isn’t bad for a large petrol 4×4. So, like any hybrid, real-life fuel economy will depend very much on how you drive the car – to enjoy high levels of economy, you need to drive the car carefully – and plug it in as much as you can. 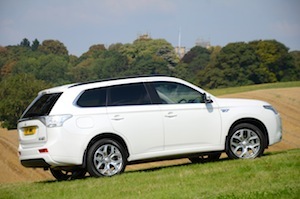 The entry-level Outlander PHEV GX3h starts at £28,249, which is a relatively low purchase price for a Plug-in Hybrid. This is after the £5,000 discount courtesy of the government’s Plug-in Car Grant. This is exactly the same price as the Outlander Diesel GX3 automatic. Having no price premium for the plug-in hybrid is a great strategy as it makes it easy for consumers – if you do lots of motorways miles, buy the diesel Outlander; if you do lots of shorter journeys, the PHEV is likely to offer lower running costs. 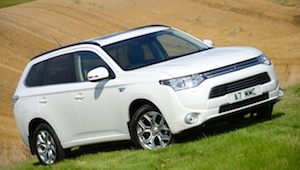 There’s also the Outlander PHEV GX4h priced at £32,899, and the GX4hs at £34,999 (both prices after the grant). 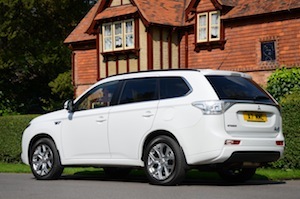 The Outlander PHEV is particularly attractive to company car buyers, as it has a benefit in kind rate of just 5%. 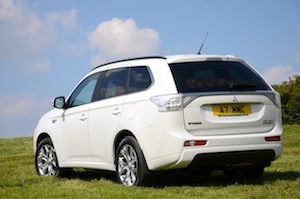 Mitsubishi calculates that the Outlander PHEV could save a 40% tax payer more than £10,000 in tax over three years compared to some other SUVs. 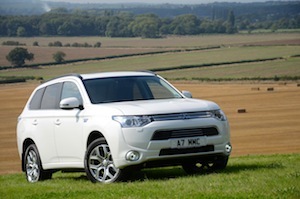 The Outlander PHEV is also exempt from the London Congestion Charge – and there’s no road tax to pay. 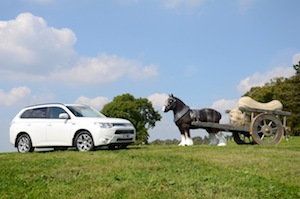 The Outlander PHEV even has a towing rating – of up to 1500 kg – something that is virtually unheard of for an electric car or a hybrid. The Outlander PHEV is a groundbreaking car because it’s the first 4×4 SUV with a decent all-electric range. The Volvo V60 Plug-in Hybrid also offers a decent all-electric range, and all-wheel drive, but it doesn’t have the off-road ability of the Outlander, or the interior space, and it’s much more expensive. 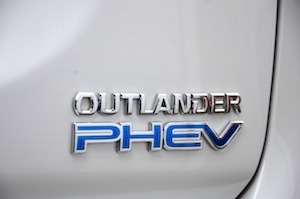 Perhaps the best recommendation for the Outlander PHEV is the fact that so many people are buying this vehicle, and a key factor in this is the very low company car tax of just 5%. This probably offsets the weak points such as the driving experience not being the most engaging in class, and particularly the infomedia system which is far off being the best in class. So after a week with the car we’re left with the Outlander PHEV maintaining its original Green-Car-Guide rating of 9 out of 10. It’s ideal for people who have driving patterns where they can use electric power for most journeys, and it gets even better for company car drivers due to potentially significant BIK tax savings. With an improved infomedia system and more direct driving responses it could score a 10 out of 10.